Busy parents and busier school officials spend inordinate amounts of time publishing confusing frequently incorrect school-oriented schedule information for kids. School events, sports, after-school activities, parent-teacher meetings, and community-school activities make for one full events calendar. Statistics show that parents utilize the Internet, email, and mobile technologies to help juggle school and life. Even parents who do not use the Internet much are frequent users of mobile technologies such as SMS, according to recent reports. But most schools insist on using labor-intensive and ineffective techniques to communicate information to parents. When this information changes, the amount of work required to inform the affected parties is often too high to even bother, and so many are affected. Google Calendar launched a while ago with what I considered then to be major holes in its feature set. At least one of those major holes was recently patched – the ability to do SMS notifications on multiple calendars. 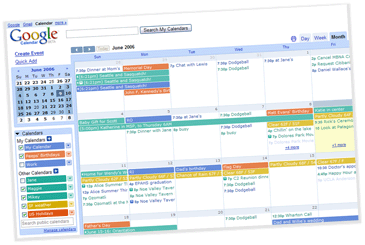 In addition, the calendar sharing and printing functions were drastically improved, pushing it into a new level of usefulness for schools and churches. The calendars can be shared or hidden to parents and students of the class for privacy reasons, and the system is very secure. Notifications of events can be sent out by calendar automatically, even for repeated events, via RSS, SMS (phone text) or email. Schools can turn off advertisements for the kids. Any calendar can be displayed on the school website, and different calendars can be shown on sections of the site. RSS means that the information can be posted a huge number of ways. Parent/Teacher conference or other invitations can be sent, and responded to, online. Comments can be entered on events and replies. Students can each have their own Google calendar, and can super-impose their class calendars with it. Families can create calendars too, so the student has a big-picture view of their lives. Snow-Day notifications, Amber-Alerts, and other emergency notices can be sent out quickly through SMS, email, and the school’s website using an immediate calendar event. It’s super easy to print out multiple formats of calendars, depending on your style. Formats are adjustable before you print them. Homework assignments can include links to web resources and school website pages inside the event description. If all schools in a district use it, then parents, administrators, athletics directors and others can use the ‘show/hide’ calendar function to do an infinite level of coordination activity VISUALLY. Parents can look at when their 3rd grader and 6th grader have school events that overlap in a bad way. We can share the calendar with our child care provider (college students use computers ;-) and also provide event commentary to her about her schedule for the next week. If schools sign up for the Google Apps Education Edition, then the kids can opt out of Advertisements, too. You’ll have to be sure you meet their terms, but most schools will no problem. I would just like to see schools begin to use centralized information management to help the parent and student body better coordinate. For a fun “black belt” course on Google Calendar, check out the lifehacker post by Gina Trapani, and for a few more tips there’s some good stuff at the StopDesign blog, including some Macintosh commentary. MCHS – but they aren’t explaining how you can embed the calendar in your own… a key feature. Lake Country School Calendar – Does a brilliant job explaining how the calendar can be used. Altus Public Schools – an awesome implementation!! New York Schools go Google. Great item. My son’s school has an online information sharing area, but it’s yet another username and password for me to remember, so I hardly ever go there. Google calendars are great… the only thing that would be nice is to be able to set up a calendar template. This would allow a teacher to put in a schedule and then the next year not have to type every single thing in again, but just modify the dates and a few of the classes, etc. Otherwise each year, some of the potentially same things, have to be re-entered. I couldn’t agree more that schools should use centralized information management tools. Paper calendars are slow and ineffective in communicating information to parents and teachers, but a real-time online calendar can be really useful. Some calendars are specifically designed for schools.